The homeowner Lisa is a life-long resident of the Newtown area and has been a school bus driver for 12 years. She has three children, and her oldest daughter is in the Air Force. Lisa’s family is very anxious to move into their new home. What a cool way to bless someone in our community! 7:20 AM – I arrived at Vance’s house to pick him up. On the way to the work site we both talked about why we wanted to do something like this. The idea of wanting to give back to our community for the sake of Christ resonated deeply with both of us. 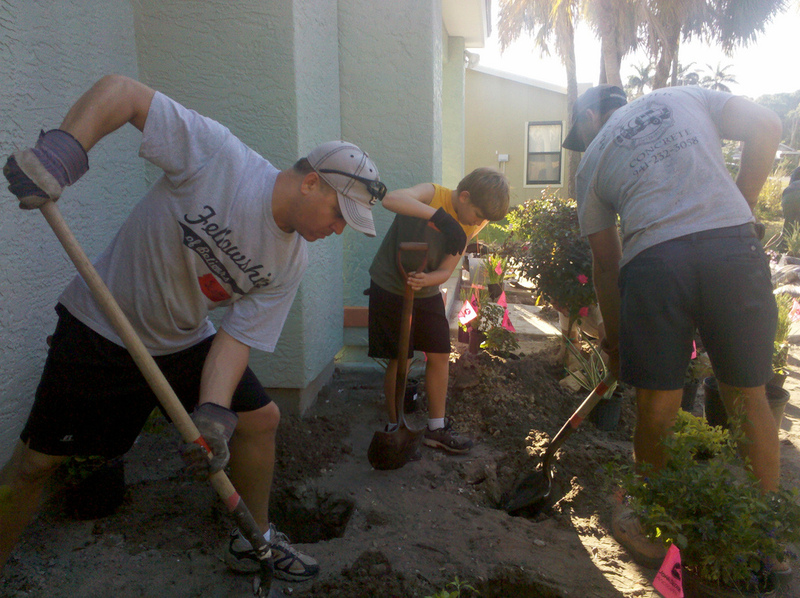 7:45 AM – Vance and I arrive at the work site and meet with a few others from our church who came out to work. Dean, the local Habitat for Humanity Director of Construction, kicks us off with a welcome, introduction of other volunteer workers (many of which are working towards their own homes), some basic instructions, and a prayer from one of the Crew Leaders. 8:00 AM – We get started right away by organizing and planting the new plants and bushes that would decorate the landscape around the house. 8:45 AM – While digging holes for plants on the side of the house, I realize that I just ripped through one of the irrigation lines that I didn’t see. As it turns out, the system won’t work well with the huge gash that I just put through the pipe. 8:50 AM – It’s a good thing that Scott and Vance are working on the irrigation system and some some pieces that allow them to fix my ‘minor modifications’. 9:30 AM – It’s break time. As we stop for a snack and some water and/or Gatorade, the crew leads take the time to tell us a little bit about the impact and rich history of Habitat for Humanity. Our whole team is impressed and honored to be a part of something that’s drastically changing lives and transforming communities. 9:45 AM – We end up talking to Gene, one of the local Habitat Crew Leads, about other community transformation projects that he’s involved with. It’s great to see the church so in touch with the needs of the community and taking an active roll in making it a better place. I’m looking forward to working more with him on a variety of initiatives. 9:55 AM – Scott (from the team from our church) prays for the rest of the project and blesses the home and the family that’ll be living there. 10:05 AM – I’m working with Samantha (and several others) in the backyard as we begin to lay the sod. I ask her why she wanted to come out and work on a project like this. She told me that she never did anything like this before, and that she thought it was fun and a great way to get involved in the community. Then she told me that she never knew Habitat for Humanity was a Christian organization, and she loved being able to pray throughout the project like we have been. 11:00 AM – Sod and other landscape work is complete in the back yard. Now to go put the finishing touches on the front.